The image on the right shows opposite branches as found in ash trees. Branches extend from the same point on the larger limbs. 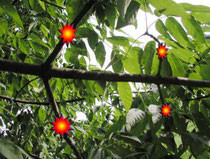 Alternate branches (NOT found in ash) extend from different points on the limb. 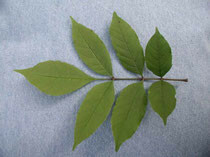 Ash leaves are generally football-shaped and present in a compound arrangement. A compound leaf is one that has more than one leaflet while the entire leaf, as defined, has a bud at its stem base (petiole). 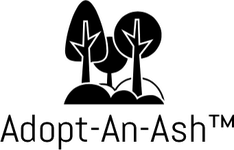 Ash typically have approximately 5-9 leaflets per leaf. 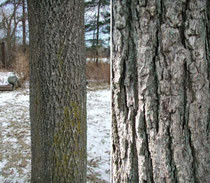 These images show the distinctive trunk ridging as found in ash trees. The bark on a younger ash tree is relatively smooth. As the tree ages the bark thickens and a diamond-like pattern in the raised bark is noticeable.